The Court of Appeal says only workers who were employed after 2015 can retire at the age of 60. The Court of Appeal says anyone who was employed when the retirement age was 55 in the national law will have to retire at 55. The Court of Appeal made this ruling in a case where about 30 former employees of ZCCM sued ZCCM for retiring them at the age of 55 when the law has changed to 60 and 65 years respectively. Earlier, the High Court ruled that ZCCM broke the law by forcing workers to retire at 55 when the Retirement age had been increased to 60 and 65. 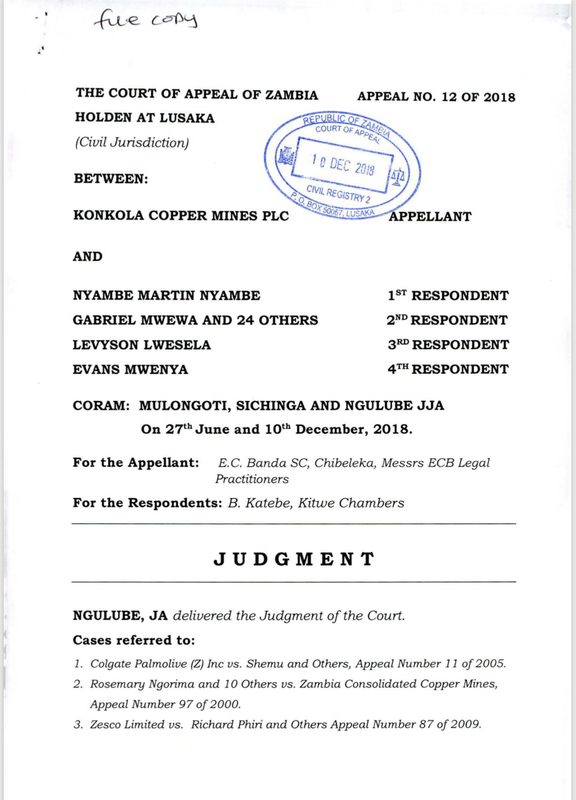 ZCCM, which was ordered to pay the retirees appealed and the Court of Appeal set aside the High Court Judgment chaining that the High Court Judge was wrong. The Court of Appeal instead said that laws do not operate retrospectively (Backwards). The Court of Appeal said that the changes to the National Pension Law is not important but what matters is the contract which the workers signed. ‘It could not have been the intention of the framers of the law to invalidate agreements that were perfectly legal at the time they were executed. The respondents’ contracts of employment, which provided that they would retire at fifty-five years are binding and cannot be varied on the basis of the amendment to the National Pension Scheme Act of 2015,’ said the Court of Appeal. ZWD comment: This what we mean when we say our courts are useless. In fact, we feel this is a constitutional matter that must be interpreted by the Constitutional Court. But then, the Constitutional Court is as useless as the rest of them. The affected workers can still try their lucky at the Constitutional Court but we have no confidence in that set up. Contradictions! So, the holding of office by the current President can only be interpreted by reference to the 1991 Constitution (as Amended by the 1996 Act)only – the 2016 Amendment not being applicable to him? Very interesting!